Over the last two years I have built a rather big fabric stash, in which a large portion is reproductions and period inspired prints. The idea of making a scrappy sampler quilt out of these prints has been lingering in my mind for some time. I want a unique sampler quilt made up of both appliqué and pieced blocks. The pieced blocks should be the more complicated ones, not just QSTs and HSTs put together. And the appliquéd ones should consisted of both hand appliqués and machine appliqués. After all, I want to use the sampler quilt as a learning tool to play with colour, improve my level of precision, and try new techniques. So far, I have completed four pieced blocks. As usual I drafted the blocks myself to get the size I wanted. The smaller ones are all about Y-seams. They are not all finished perfectly. I still have to think about how to adjust the seam allowance to have to blocks not finished 1/8" smaller then intended. Some people suggested that I have to pre-wash my fabrics to shrink them first. That will be really troublesome because I make mostly scrappy quilts and that means I have to start now prewash every piece of fabric in my stash. Also, I am not sure if shrinkage is really the key issue. Usually I do not use steam to press in progress motives. Perhaps it's more because of the bulkiness of the seams, since I found pressing the seams open does help a bit. Anyways, I have not yet tried to move the needle one or two clicks to the right as some people does to address the bulkiness issue (what if I forget to change it back to the normal position later?!) But definitely I will try next time, carefully and mindfully. 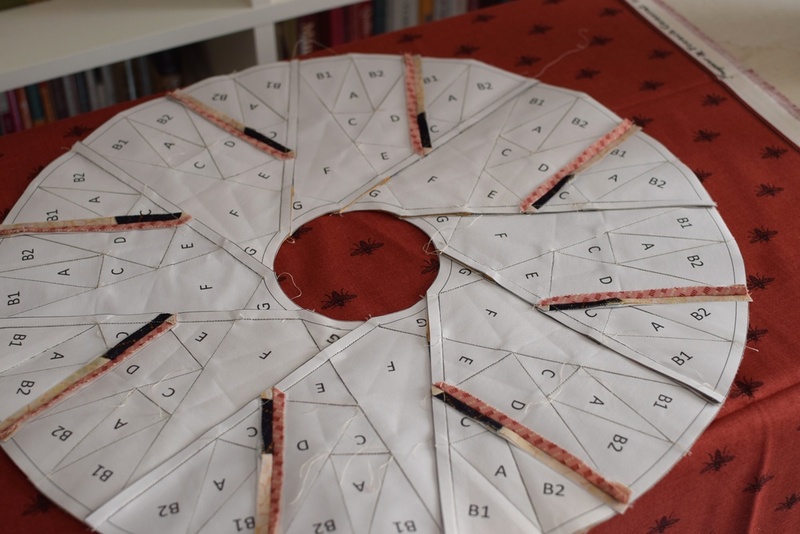 The most successful attempt is my first paper-pieced block, a Mariner's Compass design taken from Judy Mathieson's Mariner's Compass Quilts book. Again, I drafted the design in AutoCAD for the size to fit in my sampler quilt, divided them into sections, put in the alphabetical piecing order, and printed the sections with Carol Doak's legal-size foundation paper. The piecing was done with a size 90/14 sharp needle. The entire process was not so smooth as I had to rip out wrongly placed seams several times, but the end result is just so stunning. And best of all, the block is not finished 1/8" smaller. I didn't tried my best to cut the background with prints matching at the seams. I had the bad habit/tendency of wrapping everything up as quick as possible towards the end of a project. Besides the in progress sampler quilt, there was actually a small project done last month. A Sunburst block placemat that was 80% hand-stitched! It's my first attempt in hand piecing and unfortunately it's the lease precise block I've ever made so far! But surprisingly, it doesn't look that bad at all, especially after I put a little invisible machine appliqué floral motif in the centre to withdraw my attention away from the no-so-pointy-points hahahah.